The fortress castle Pfalzgrafenstein, the "Pfalz im Rhein", is an extraordinary stronghold in the middle of the Rhine, across from the little town of Kaub. It has a six-cornered ring wall and covered battlements and is protected by a falling barred gate. It was built in 1326-1327 by King Ludwig von Bayern for the sole purpose of collecting the tolls of the Rhine shipping and is comparable to similar establishments such as the Mäuseturm ("Mice Tower") a few kilometres up stream at Bingen. These fees brought considerable income and the fortresses were built to administer their collection. The Pfalzgrafenstein castle received its final form in the 17h century, when it was strengthened against the ice of the lower part of the Rhine. The strongly fortified and barely conquerable fortress of Gutenfels on a mountain spur over the little city Kaub secured the stronghold in the Rhine efficiently. 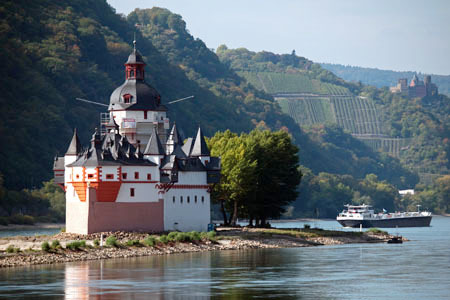 Today, the Castle Pfalzgrafenstein is a special attraction of every "Romantic" Rhine cruise between Bingen and Koblenz. There was nothing of this romance in medieval times, though, when the boats were towed upstream by horses and the trip downstream was difficult and dangerous. No sooner did one pass successfully through the customs post at Kaub, than the hostile narrows at the rock of Loreley (Ley=rock) needed to be dealt with. Just one kilometre further on was the next customs post at St. Goar, where there was a perfect barrier of three fortresses, so that the powerful of that time again could fill their bags.